The Exact Editions service started with an ‘aggregation’ model for digital subscriptions to magazines. There is an Exact Editions shop where you can buy most of our magazines. Then we added ‘shops’ for magazine subscriptions in Euros, and another for Australian magazines. As we have started working for book publishers we have worked with a different model. We are building shops ‘per publisher’ branded for each publisher. There are now shops for Berkshire Publishing, Debretts, Alastair Sawday’s, Profile Books, Time Out and recently Gower. There is a page on our service where all these shops and more can be referenced. The book publisher’s shops are branded for the individual publisher. 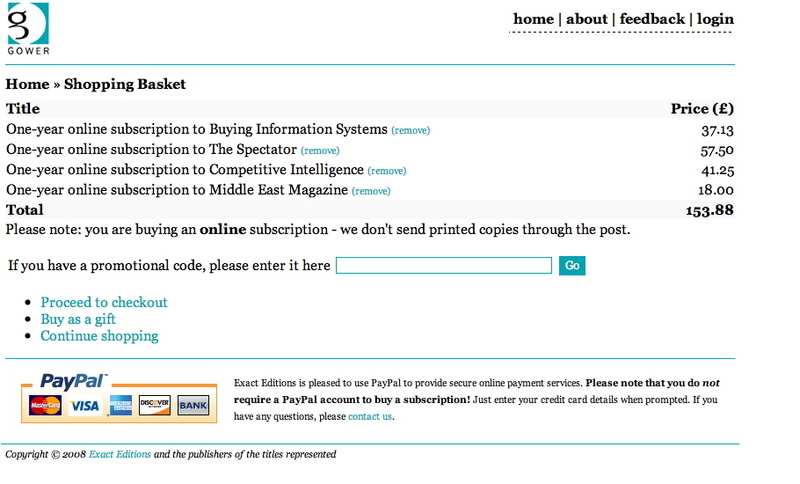 Different shops, different publishers, different languages, different currencies — but for the individual who buys a subscription there is only one account, one service. All his/her/its content goes in the same account (‘its’ for the institutions — did not earlier mention the various ‘institutional shops’ we now support). As was to be expected, users are now buying collections of mixed magazines and books in the same shopping basket. This ability to buy, search and read books and magazines in the same way from different publishers will become an important factor in our appeal to small and medium-sized publishers. Here is a mixed shopping basket, which has the ‘look and feel’ of the Gower shop because the two Gower books were those most recently added to it. What you cannot do at the present time is buy books and magazines priced in different currencies in the same shopping basket. Mind you, this isnt a real limitation because you can buy in different currencies from the same account. PayPal or your credit card can see to that.